"Alchemist" redirects here. For other uses, see Alchemist (disambiguation) and Alchemy (disambiguation). Alchemy (from Arabic: al-kīmiyā) was an ancient branch of natural philosophy, a philosophical and protoscientific tradition practiced throughout Europe, Africa, and Asia, originating in Greco-Roman Egypt (primarily Alexandria) in the first few centuries AD. It aims to purify, mature, and perfect certain objects. [n 1] Common aims were chrysopoeia, the transmutation of "base metals" (e.g., lead) into "noble metals" (particularly gold); the creation of an elixir of immortality; the creation of panaceas able to cure any disease; and the development of an alkahest, a universal solvent. The perfection of the human body and soul was thought to permit or result from the alchemical magnum opus and, in the Hellenistic and Western mystery tradition, the achievement of gnosis. In Europe, the creation of a philosopher's stone was variously connected with all of these projects. In English, the term is often limited to descriptions of European alchemy, but similar practices existed in the Far East, the Indian subcontinent, and the Muslim world. In Europe, following the 12th-century Renaissance produced by the translation of Medieval Islamic works on science and the rediscovery of Aristotelian philosophy, alchemists played a significant role in early modern science (particularly chemistry and medicine). Islamic and European alchemists developed a structure of basic laboratory techniques, theory, terminology, and experimental method, some of which are still in use today. However, they continued antiquity's belief in four elements and guarded their work in secrecy including cyphers and cryptic symbolism. Their work was guided by Hermetic principles related to magic, mythology, and religion. Modern discussions of alchemy are generally split into an examination of its exoteric practical applications and its esoteric spiritual aspects, despite the arguments of scholars like Holmyard and von Franz that they should be understood as complementary. The former is pursued by historians of the physical sciences who examine the subject in terms of early chemistry, medicine, and charlatanism, and the philosophical and religious contexts in which these events occurred. The latter interests historians of esotericism, psychologists, and some philosophers and spiritualists. The subject has also made an ongoing impact on literature and the arts. Despite this split, which von Franz believes has existed since the Western traditions' origin in a mix of Greek philosophy that was mixed with Egyptian and Mesopotamian technology, numerous sources have stressed an integration of esoteric and exoteric approaches to alchemy as far back as Pseudo-Democritus's first-century AD On Physical and Mystical Matters (Greek: Physika kai Mystika). The word alchemy comes from Old French alquemie, alkimie, used in Medieval Latin as alchymia. This name was itself brought from the Arabic word al-kīmiyā' (الكيمياء‎ or الخيمياء‎) composed of two parts: the Late Greek term khēmeía (χημεία), khēmía (χημία), meaning 'to fuse or cast a metal', and the Arabic definite article al- (الـ‎), meaning 'The'. Together this association can be interpreted as 'the process of transmutation by which to fuse or reunite with the divine or original form'. Its roots can be traced to the Egyptian name kēme (hieroglyphic 𓆎𓅓𓏏𓊖 khmi ), meaning 'black earth' which refers to the fertile and auriferous soil of the Nile valley, as opposed to red desert sand. The Medieval Latin form was influenced by Greek chymeia (χυμεία) meaning 'mixture' and referring to pharmaceutical chemistry. Alchemy is several philosophical traditions spanning some four millennia and three continents. These traditions' general penchant for cryptic and symbolic language makes it hard to trace their mutual influences and "genetic" relationships. One can distinguish at least three major strands, which appear to be largely independent, at least in their earlier stages: Chinese alchemy, centered in China and its zone of cultural influence; Indian alchemy, centered on the Indian subcontinent; and Western alchemy, which occurred around the Mediterranean and whose center has shifted over the millennia from Greco-Roman Egypt, to the Islamic world, and finally medieval Europe. Chinese alchemy was closely connected to Taoism and Indian alchemy with the Dharmic faiths, whereas Western alchemy developed its own philosophical system that was largely independent of, but influenced by, various Western religions. It is still an open question whether these three strands share a common origin, or to what extent they influenced each other. Ambix, cucurbit and retort of Zosimos, from Marcelin Berthelot, Collection des anciens alchimistes grecs (3 vol., Paris, 1887–1888). The start of Western alchemy may generally be traced to ancient and Hellenistic Egypt, where the city of Alexandria was a center of alchemical knowledge, and retained its pre-eminence through most of the Greek and Roman periods. Here, elements of technology, religion, mythology, and Hellenistic philosophy, each with their own much longer histories, combined to form the earliest known records of alchemy in the West. Zosimos of Panopolis wrote the oldest known books on alchemy,[citation needed] while Mary the Jewess is credited as being the first non-fictitious Western alchemist. They wrote in Greek and lived in Egypt under Roman rule. Mythology – Zosimos of Panopolis asserted that alchemy dated back to Pharaonic Egypt where it was the domain of the priestly class, though there is little to no evidence for his assertion. Alchemical writers used Classical figures from Greek, Roman, and Egyptian mythology to illuminate their works and allegorize alchemical transmutation. These included the pantheon of gods related to the Classical planets, Isis, Osiris, Jason, and many others. The central figure in the mythology of alchemy is Hermes Trismegistus (or Thrice-Great Hermes). His name is derived from the god Thoth and his Greek counterpart Hermes. Hermes and his caduceus or serpent-staff, were among alchemy's principal symbols. According to Clement of Alexandria, he wrote what were called the "forty-two books of Hermes", covering all fields of knowledge. The Hermetica of Thrice-Great Hermes is generally understood to form the basis for Western alchemical philosophy and practice, called the hermetic philosophy by its early practitioners. These writings were collected in the first centuries of the common era. Technology – The dawn of Western alchemy is sometimes associated with that of metallurgy, extending back to 3500 BC. Many writings were lost when the emperor Diocletian ordered the burning of alchemical books after suppressing a revolt in Alexandria (AD 292). Few original Egyptian documents on alchemy have survived, most notable among them the Stockholm papyrus and the Leyden papyrus X. Dating from AD 300–500, they contained recipes for dyeing and making artificial gemstones, cleaning and fabricating pearls, and manufacturing of imitation gold and silver. These writings lack the mystical, philosophical elements of alchemy, but do contain the works of Bolus of Mendes (or Pseudo-Democritus), which aligned these recipes with theoretical knowledge of astrology and the classical elements. Between the time of Bolus and Zosimos, the change took place that transformed this metallurgy into a Hermetic art. Most of the Greco-Roman alchemists preceding Zosimos are known only by pseudonyms, such as Moses, Isis, Cleopatra, Democritus, and Ostanes. Others authors such as Komarios, and Chymes, we only know through fragments of text. After AD 400, Greek alchemical writers occupied themselves solely in commenting on the works of these predecessors. By the middle of the 7th century alchemy was almost an entirely mystical discipline. It was at that time that Khalid Ibn Yazid sparked its migration from Alexandria to the Islamic world, facilitating the translation and preservation of Greek alchemical texts in the 8th and 9th centuries. The Vedas describe a connection between eternal life and gold. The use of Mercury for alchemy is first documented in the 3rd- or 4th-century Arthashastra. Buddhist texts from the 2nd to 5th centuries mention the transmutation of base metals to gold. Greek alchemy may have been introduced to Ancient India through the invasions of Alexander the Great in 325 BC, and kingdoms that were culturally influenced by the Greeks like Gandhāra, although hard evidence for this is lacking. Two famous early Indian alchemical authors were Nāgārjuna Siddha and Nityanātha Siddha. Nāgārjuna Siddha was a Buddhist monk. His book, Rasendramangalam, is an example of Indian alchemy and medicine. Nityanātha Siddha wrote Rasaratnākara, also a highly influential work. In Sanskrit, rasa translates to "mercury", and Nāgārjuna Siddha was said to have developed a method of converting mercury into gold. An important modern bibliography on Indian alchemical studies has also been provided by David Gordon White at Oxford Bibliographies Online. The contents of 39 Sanskrit alchemical treatises have been analysed in detail in G. Jan Meulenbeld's History of Indian Medical Literature. [n 2] The discussion of these works in HIML gives a summary of the contents of each work, their special features, and where possible the evidence concerning their dating. Chapter 13 of HIML, Various works on rasaśāstra and ratnaśāstra (or Various works on alchemy and gems) gives brief details of a further 655 (six hundred and fifty-five) treatises. In some cases Meulenbeld gives notes on the contents and authorship of these works; in other cases references are made only to the unpublished manuscripts of these titles. Jabir ibn Hayyan (Geber), considered the "father of chemistry", introduced a scientific and experimental approach to alchemy. After the fall of the Roman Empire, the focus of alchemical development moved to the Islamic World. Much more is known about Islamic alchemy because it was better documented: indeed, most of the earlier writings that have come down through the years were preserved as Arabic translations. The word alchemy itself was derived from the Arabic word al-kīmiyā' (الكيمياء). The early Islamic world was a melting pot for alchemy. Platonic and Aristotelian thought, which had already been somewhat appropriated into hermetical science, continued to be assimilated during the late 7th and early 8th centuries through Syriac translations and scholarship. To form an idea of the historical place of Jabir's alchemy and to tackle the problem of its sources, it is advisable to compare it with what remains to us of the alchemical literature in the Greek language. One knows in which miserable state this literature reached us. Collected by Byzantine scientists from the tenth century, the corpus of the Greek alchemists is a cluster of incoherent fragments, going back to all the times since the third century until the end of the Middle Ages. Early Islamic chemists such as Jabir Ibn Hayyan, Al-Kindi ("Alkindus") and Muhammad ibn Zakarīya Rāzi ("Rasis" or "Rhazes") contributed a number of key chemical discoveries, such as the muriatic (hydrochloric acid), sulfuric and nitric acids, and more. The discovery that aqua regia, a mixture of nitric and hydrochloric acids, could dissolve the noblest metal, gold, was to fuel the imagination of alchemists for the next millennium. Islamic philosophers also made great contributions to alchemical hermeticism. The most influential author in this regard was arguably Jabir. Jabir's ultimate goal was Takwin, the artificial creation of life in the alchemical laboratory, up to, and including, human life. He analyzed each Aristotelian element in terms of four basic qualities of hotness, coldness, dryness, and moistness. According to Jabir, in each metal two of these qualities were interior and two were exterior. For example, lead was externally cold and dry, while gold was hot and moist. Thus, Jabir theorized, by rearranging the qualities of one metal, a different metal would result. By this reasoning, the search for the philosopher's stone was introduced to Western alchemy. Jabir developed an elaborate numerology whereby the root letters of a substance's name in Arabic, when treated with various transformations, held correspondences to the element's physical properties. The elemental system used in medieval alchemy also originated with Jabir. His original system consisted of seven elements, which included the five classical elements (aether, air, earth, fire, and water) in addition to two chemical elements representing the metals: sulphur, "the stone which burns", which characterized the principle of combustibility, and mercury, which contained the idealized principle of metallic properties. Shortly thereafter, this evolved into eight elements, with the Arabic concept of the three metallic principles: sulphur giving flammability or combustion, mercury giving volatility and stability, and salt giving solidity. The atomic theory of corpuscularianism, where all physical bodies possess an inner and outer layer of minute particles or corpuscles, also has its origins in the work of Jabir. From the 9th to 14th centuries, alchemical theories faced criticism from a variety of practical Muslim chemists, including Alkindus, Abū al-Rayhān al-Bīrūnī, Avicenna and Ibn Khaldun. In particular, they wrote refutations against the idea of the transmutation of metals. Whereas European alchemy eventually centered on the transmutation of base metals into noble metals, Chinese alchemy had a more obvious connection to medicine. The philosopher's stone of European alchemists can be compared to the Grand Elixir of Immortality sought by Chinese alchemists. However, in the hermetic view, these two goals were not unconnected, and the philosopher's stone was often equated with the universal panacea; therefore, the two traditions may have had more in common than initially appears. Black powder may have been an important invention of Chinese alchemists. As previously stated above, Chinese alchemy was more related to medicine. It is said that the Chinese invented gunpowder while trying to find a potion for eternal life. Described in 9th-century texts[citation needed] and used in fireworks in China by the 10th century,[citation needed] it was used in cannons by 1290. [citation needed] From China, the use of gunpowder spread to Japan, the Mongols, the Muslim world, and Europe. Gunpowder was used by the Mongols against the Hungarians in 1241, and in Europe by the 14th century. The introduction of alchemy to Latin Europe may be dated to 11 February 1144, with the completion of Robert of Chester's translation of the Arabic Book of the Composition of Alchemy. Although European craftsmen and technicians preexisted, Robert notes in his preface that alchemy was unknown in Latin Europe at the time of his writing. The translation of Arabic texts concerning numerous disciplines including alchemy flourished in 12th-century Toledo, Spain, through contributors like Gerard of Cremona and Adelard of Bath. Translations of the time included the Turba Philosophorum, and the works of Avicenna and al-Razi. These brought with them many new words to the European vocabulary for which there was no previous Latin equivalent. Alcohol, carboy, elixir, and athanor are examples. Meanwhile, theologian contemporaries of the translators made strides towards the reconciliation of faith and experimental rationalism, thereby priming Europe for the influx of alchemical thought. The 11th-century St Anselm put forth the opinion that faith and rationalism were compatible and encouraged rationalism in a Christian context. In the early 12th century, Peter Abelard followed Anselm's work, laying down the foundation for acceptance of Aristotelian thought before the first works of Aristotle had reached the West. In the early 13th century, Robert Grosseteste used Abelard's methods of analysis and added the use of observation, experimentation, and conclusions when conducting scientific investigations. Grosseteste also did much work to reconcile Platonic and Aristotelian thinking. Through much of the 12th and 13th centuries, alchemical knowledge in Europe remained centered on translations, and new Latin contributions were not made. The efforts of the translators were succeeded by that of the encyclopaedists. In the 13th century, Albertus Magnus and Roger Bacon were the most notable of these, their work summarizing and explaining the newly imported alchemical knowledge in Aristotelian terms. Albertus Magnus, a Dominican friar, is known to have written works such as the Book of Minerals where he observed and commented on the operations and theories of alchemical authorities like Hermes and Democritus and unnamed alchemists of his time. Albertus critically compared these to the writings of Aristotle and Avicenna, where they concerned the transmutation of metals. From the time shortly after his death through to the 15th century, more than 28 alchemical tracts were misattributed to him, a common practice giving rise to his reputation as an accomplished alchemist. Likewise, alchemical texts have been attributed to Albert's student Thomas Aquinas. Roger Bacon, a Franciscan friar who wrote on a wide variety of topics including optics, comparative linguistics, and medicine, composed his Great Work (Latin: Opus Majus) for Pope Clement IV as part of a project towards rebuilding the medieval university curriculum to include the new learning of his time. While alchemy was not more important to him than other sciences and he did not produce allegorical works on the topic, he did consider it and astrology to be important parts of both natural philosophy and theology and his contributions advanced alchemy's connections to soteriology and Christian theology. Bacon's writings integrated morality, salvation, alchemy, and the prolongation of life. His correspondence with Clement highlighted this, noting the importance of alchemy to the papacy. Like the Greeks before him, Bacon acknowledged the division of alchemy into practical and theoretical spheres. He noted that the theoretical lay outside the scope of Aristotle, the natural philosophers, and all Latin writers of his time. The practical, however, confirmed the theoretical thought experiment, and Bacon advocated its uses in natural science and medicine. In later European legend, however, Bacon became an archmage. In particular, along with Albertus Magnus, he was credited with the forging of a brazen head capable of answering its owner's questions. Soon after Bacon, the influential work of Pseudo-Geber (sometimes identified as Paul of Taranto) appeared. His Summa Perfectionis remained a staple summary of alchemical practice and theory through the medieval and renaissance periods. It was notable for its inclusion of practical chemical operations alongside sulphur-mercury theory, and the unusual clarity with which they were described. By the end of the 13th century, alchemy had developed into a fairly structured system of belief. Adepts believed in the macrocosm-microcosm theories of Hermes, that is to say, they believed that processes that affect minerals and other substances could have an effect on the human body (for example, if one could learn the secret of purifying gold, one could use the technique to purify the human soul). They believed in the four elements and the four qualities as described above, and they had a strong tradition of cloaking their written ideas in a labyrinth of coded jargon set with traps to mislead the uninitiated. Finally, the alchemists practiced their art: they actively experimented with chemicals and made observations and theories about how the universe operated. Their entire philosophy revolved around their belief that man's soul was divided within himself after the fall of Adam. By purifying the two parts of man's soul, man could be reunited with God. In the 14th century, alchemy became more accessible to Europeans outside the confines of Latin speaking churchmen and scholars. Alchemical discourse shifted from scholarly philosophical debate to an exposed social commentary on the alchemists themselves. Dante, Piers Plowman, and Chaucer all painted unflattering pictures of alchemists as thieves and liars. Pope John XXII's 1317 edict, Spondent quas non exhibent forbade the false promises of transmutation made by pseudo-alchemists. In 1403, Henry IV of England banned the practice of multiplying metals (although it was possible to buy a licence to attempt to make gold alchemically, and a number were granted by Henry VI and Edward IV). These critiques and regulations centered more around pseudo-alchemical charlatanism than the actual study of alchemy, which continued with an increasingly Christian tone. The 14th century saw the Christian imagery of death and resurrection employed in the alchemical texts of Petrus Bonus, John of Rupescissa, and in works written in the name of Raymond Lull and Arnold of Villanova. Nicolas Flamel is a well-known alchemist, but a good example of pseudepigraphy, the practice of giving your works the name of someone else, usually more famous. Although the historical Flamel existed, the writings and legends assigned to him only appeared in 1612. Flamel was not a religious scholar as were many of his predecessors, and his entire interest in the subject revolved around the pursuit of the philosopher's stone. His work spends a great deal of time describing the processes and reactions, but never actually gives the formula for carrying out the transmutations. Most of 'his' work was aimed at gathering alchemical knowledge that had existed before him, especially as regarded the philosopher's stone. Through the 14th and 15th centuries, alchemists were much like Flamel: they concentrated on looking for the philosophers' stone. Bernard Trevisan and George Ripley made similar contributions. Their cryptic allusions and symbolism led to wide variations in interpretation of the art. The red sun rising over the city, the final illustration of 16th-century alchemical text, Splendor Solis. The word rubedo, meaning "redness", was adopted by alchemists and signalled alchemical success, and the end of the great work. In the late 15th century, Marsilo Ficino translated the Corpus Hermeticum and the works of Plato into Latin. These were previously unavailable to Europeans who for the first time had a full picture of the alchemical theory that Bacon had declared absent. Renaissance Humanism and Renaissance Neoplatonism guided alchemists away from physics to refocus on mankind as the alchemical vessel. Esoteric systems developed that blended alchemy into a broader occult Hermeticism, fusing it with magic, astrology, and Christian cabala. A key figure in this development was German Heinrich Cornelius Agrippa (1486–1535), who received his Hermetic education in Italy in the schools of the humanists. In his De Occulta Philosophia, he attempted to merge Kabbalah, Hermeticism, and alchemy. He was instrumental in spreading this new blend of Hermeticism outside the borders of Italy. John Dee (13 July 1527 – December, 1608) followed Agrippa's occult tradition. Although better known for angel summoning, divination, and his role as astrologer, cryptographer, and consultant to Queen Elizabeth I, Dee's alchemical Monas Hieroglyphica, written in 1564 was his most popular and influential work. His writing portrayed alchemy as a sort of terrestrial astronomy in line with the Hermetic axiom As above so below. During the 17th century, a short-lived "supernatural" interpretation of alchemy became popular, including support by fellows of the Royal Society: Robert Boyle and Elias Ashmole. Proponents of the supernatural interpretation of alchemy believed that the philosopher's stone might be used to summon and communicate with angels. Entrepreneurial opportunities were common for the alchemists of Renaissance Europe. Alchemists were contracted by the elite for practical purposes related to mining, medical services, and the production of chemicals, medicines, metals, and gemstones. Rudolf II, Holy Roman Emperor, in the late 16th century, famously received and sponsored various alchemists at his court in Prague, including Dee and his associate Edward Kelley. King James IV of Scotland, Julius, Duke of Brunswick-Lüneburg, Henry V, Duke of Brunswick-Lüneburg, Augustus, Elector of Saxony, Julius Echter von Mespelbrunn, and Maurice, Landgrave of Hesse-Kassel all contracted alchemists. John's son Arthur Dee worked as a court physician to Michael I of Russia and Charles I of England but also compiled the alchemical book Fasciculus Chemicus. Although most of these appointments were legitimate, the trend of pseudo-alchemical fraud continued through the Renaissance. Betrüger would use sleight of hand, or claims of secret knowledge to make money or secure patronage. Legitimate mystical and medical alchemists such as Michael Maier and Heinrich Khunrath wrote about fraudulent transmutations, distinguishing themselves from the con artists. False alchemists were sometimes prosecuted for fraud. The terms "chemia" and "alchemia" were used as synonyms in the early modern period, and the differences between alchemy, chemistry and small-scale assaying and metallurgy were not as neat as in the present day. There were important overlaps between practitioners, and trying to classify them into alchemists, chemists and craftsmen is anachronistic. For example, Tycho Brahe (1546–1601), an alchemist better known for his astronomical and astrological investigations, had a laboratory built at his Uraniborg observatory/research institute. Michael Sendivogius (Michał Sędziwój, 1566–1636), a Polish alchemist, philosopher, medical doctor and pioneer of chemistry wrote mystical works but is also credited with distilling oxygen in a lab sometime around 1600. Sendivogious taught his technique to Cornelius Drebbel who, in 1621, applied this in a submarine. Isaac Newton devoted considerably more of his writing to the study of alchemy (see Isaac Newton's occult studies) than he did to either optics or physics. Other early modern alchemists who were eminent in their other studies include Robert Boyle, and Jan Baptist van Helmont. Their Hermeticism complemented rather than precluded their practical achievements in medicine and science. An alchemist, pictured in Charles Mackay's Extraordinary Popular Delusions and the Madness of Crowds. The decline of European alchemy was brought about by the rise of modern science with its emphasis on rigorous quantitative experimentation and its disdain for "ancient wisdom". Although the seeds of these events were planted as early as the 17th century, alchemy still flourished for some two hundred years, and in fact may have reached its peak in the 18th century. As late as 1781 James Price claimed to have produced a powder that could transmute mercury into silver or gold. Early modern European alchemy continued to exhibit a diversity of theories, practices, and purposes: "Scholastic and anti-Aristotelian, Paracelsian and anti-Paracelsian, Hermetic, Neoplatonic, mechanistic, vitalistic, and more—plus virtually every combination and compromise thereof." Robert Boyle (1627–1691) pioneered the scientific method in chemical investigations. He assumed nothing in his experiments and compiled every piece of relevant data. Boyle would note the place in which the experiment was carried out, the wind characteristics, the position of the Sun and Moon, and the barometer reading, all just in case they proved to be relevant. This approach eventually led to the founding of modern chemistry in the 18th and 19th centuries, based on revolutionary discoveries of Lavoisier and John Dalton. In the 19th-century revival of alchemy, the two most seminal figures were Mary Anne Atwood and Ethan Allen Hitchcock, who independently published similar works regarding spiritual alchemy. Both forwarded a completely esoteric view of alchemy, as Atwood claimed: "No modern art or chemistry, notwithstanding all its surreptitious claims, has any thing in common with Alchemy." Atwood's work influenced subsequent authors of the occult revival including Eliphas Levi, Arthur Edward Waite, and Rudolf Steiner. Hitchcock, in his Remarks Upon Alchymists (1855) attempted to make a case for his spiritual interpretation with his claim that the alchemists wrote about a spiritual discipline under a materialistic guise in order to avoid accusations of blasphemy from the church and state. In 1845, Baron Carl Reichenbach, published his studies on Odic force, a concept with some similarities to alchemy, but his research did not enter the mainstream of scientific discussion. Several women appear in the earliest history of alchemy. Michael Maier names Mary the Jewess, Cleopatra the Alchemist and Taphnutia as the four women who knew how to make the philosopher's stone. Zosimos' sister Theosebia (later known as Euthica the Arab) and Isis the Prophetess also played a role in early alchemical texts. The first alchemist whose name we know is said to have been Mary the Jewess (c. 200 A.D.). Early sources claim that Mary (or Maria) devised a number of improvements to alchemical equipment and tools as well as novel techniques in chemistry. Her best known advances were in heating and distillation processes. The laboratory water-bath, known eponymously (especially in France) as the bain-marie, is said to have been invented or at least improved by her. Essentially a double-boiler, it was (and is) used in chemistry for processes that require gentle heating. The tribikos (a modified distillation apparatus) and the kerotakis (a more intricate apparatus used especially for sublimations) are two other advancements in the process of distillation that are credited to her. The occasional claim that Mary was the first to discover hydrochloric acid is not accepted by most authorities. Although we have no writing from Mary herself, she is known from the early-fourth-century writings of Zosimos of Panopolis. Due to the proliferation of pseudepigrapha and anonymous works, it is difficult to know which of the alchemists were actually women. After the Greco-Roman period, women's names appear less frequently in the alchemical literature. Women vacate the history of alchemy during the medieval and renaissance periods, aside from the fictitious account of Perenelle Flamel. Mary Anne Atwood's A Suggestive Inquiry into the Hermetic Mystery (1850) marks their return during the nineteenth-century occult revival. The history of alchemy has become a significant and recognized subject of academic study. As the language of the alchemists is analyzed, historians are becoming more aware of the intellectual connections between that discipline and other facets of Western cultural history, such as the evolution of science and philosophy, the sociology and psychology of the intellectual communities, kabbalism, spiritualism, Rosicrucianism, and other mystic movements. Institutions involved in this research include The Chymistry of Isaac Newton project at Indiana University, the University of Exeter Centre for the Study of Esotericism (EXESESO), the European Society for the Study of Western Esotericism (ESSWE), and the University of Amsterdam's Sub-department for the History of Hermetic Philosophy and Related Currents. A large collection of books on alchemy is kept in the Bibliotheca Philosophica Hermetica in Amsterdam. A recipe found in a mid-19th-century kabbalah based book features step by step instructions on turning copper into gold. The author attributed this recipe to an ancient manuscript he located. Western alchemical theory corresponds to the worldview of late antiquity in which it was born. Concepts were imported from Neoplatonism and earlier Greek cosmology. As such, the Classical elements appear in alchemical writings, as do the seven Classical planets and the corresponding seven metals of antiquity. Similarly, the gods of the Roman pantheon who are associated with these luminaries are discussed in alchemical literature. The concepts of prima materia and anima mundi are central to the theory of the philosopher's stone. In the eyes of a variety of esoteric and Hermetic practitioners, alchemy is fundamentally spiritual. Transmutation of lead into gold is presented as an analogy for personal transmutation, purification, and perfection. The writings attributed to Hermes Trismegistus are a primary source of alchemical theory. He is named "alchemy's founder and chief patron, authority, inspiration and guide". 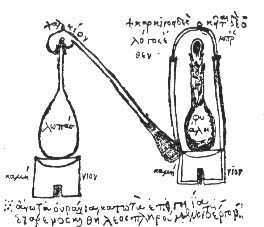 Early alchemists, such as Zosimos of Panopolis (c. AD 300), highlight the spiritual nature of the alchemical quest, symbolic of a religious regeneration of the human soul. This approach continued in the Middle Ages, as metaphysical aspects, substances, physical states, and material processes were used as metaphors for spiritual entities, spiritual states, and, ultimately, transformation. In this sense, the literal meanings of 'Alchemical Formulas' were a blind, hiding their true spiritual philosophy. Practitioners and patrons such as Melchior Cibinensis and Pope Innocent VIII existed within the ranks of the church, while Martin Luther applauded alchemy for its consistency with Christian teachings. Both the transmutation of common metals into gold and the universal panacea symbolized evolution from an imperfect, diseased, corruptible, and ephemeral state toward a perfect, healthy, incorruptible, and everlasting state, so the philosopher's stone then represented a mystic key that would make this evolution possible. Applied to the alchemist himself, the twin goal symbolized his evolution from ignorance to enlightenment, and the stone represented a hidden spiritual truth or power that would lead to that goal. In texts that are written according to this view, the cryptic alchemical symbols, diagrams, and textual imagery of late alchemical works typically contain multiple layers of meanings, allegories, and references to other equally cryptic works; and must be laboriously decoded to discover their true meaning. Due to the complexity and obscurity of alchemical literature, and the 18th-century disappearance of remaining alchemical practitioners into the area of chemistry; the general understanding of alchemy has been strongly influenced by several distinct and radically different interpretations. Those focusing on the exoteric, such as historians of science Lawrence M. Principe and William R. Newman, have interpreted the 'decknamen' (or code words) of alchemy as physical substances. These scholars have reconstructed physicochemical experiments that they say are described in medieval and early modern texts. At the opposite end of the spectrum, focusing on the esoteric, scholars, such as George Calian and Anna Marie Roos, who question the reading of Principe and Newman, interpret these same decknamen as spiritual, religious, or psychological concepts. Today new interpretations of alchemy are still perpetuated, sometimes merging in concepts from New Age or radical environmentalism movements. Groups like the Rosicrucians and Freemasons have a continued interest in alchemy and its symbolism. Since the Victorian revival of alchemy, "occultists reinterpreted alchemy as a spiritual practice, involving the self-transformation of the practitioner and only incidentally or not at all the transformation of laboratory substances", which has contributed to a merger of magic and alchemy in popular thought. Traditional medicine can use the concept of the transmutation of natural substances, using pharmacological or a combination of pharmacological and spiritual techniques. In Ayurveda, the samskaras are claimed to transform heavy metals and toxic herbs in a way that removes their toxicity. These processes are actively used to the present day. Spagyrists of the 20th century, Albert Richard Riedel and Jean Dubuis, merged Paracelsian alchemy with occultism, teaching laboratory pharmaceutical methods. The schools they founded, Les Philosophes de la Nature and The Paracelsus Research Society, popularized modern spagyrics including the manufacture of herbal tinctures and products. The courses, books, organizations, and conferences generated by their students continue to influence popular applications of alchemy as a New Age medicinal practice. Alchemical symbolism has been important in depth and analytical psychology and was revived and popularized from near extinction by the Swiss psychologist Carl Gustav Jung. Initially confounded and at odds with alchemy and its images, after being given a copy of the translation of The Secret of the Golden Flower, a Chinese alchemical text, by his friend Richard Wilhelm, Jung discovered a direct correlation or parallels between the symbolic images in the alchemical drawings and the inner, symbolic images coming up in dreams, visions or imaginations during the psychic processes of transformation occurring in his patients. A process, which he called "process of individuation". He regarded the alchemical images as symbols expressing aspects of this "process of individuation" of which the creation of the gold or lapis within were symbols for its origin and goal. Together with his alchemical mystica soror, Jungian Swiss analyst Marie-Louise von Franz, Jung began collecting all the old alchemical texts available, compiled a lexicon of key phrases with cross-references and pored over them. The volumes of work he wrote brought new light into understanding the art of transubstantiation and renewed alchemy's popularity as a symbolic process of coming into wholeness as a human being where opposites brought into contact and inner and outer, spirit and matter are reunited in the hieros gamos or divine marriage. His writings are influential in psychology and for persons who have an interest in understanding the importance of dreams, symbols and the unconscious archetypal forces (archetypes) that influence all of life. Both von Franz and Jung have contributed greatly to the subject and work of alchemy and its continued presence in psychology as well as contemporary culture. Jung wrote volumes on alchemy and his magnum opus is Volume 14 of his Collected Works, Mysterium Conuinctionis. Ralph Metzner, speaking to CG Jung Society of Seattle, 2014, sees the historical emergence of psychedelics in the work of alchemists. Alchemy has had a long-standing relationship with art, seen both in alchemical texts and in mainstream entertainment. Literary alchemy appears throughout the history of English literature from Shakespeare to J. K. Rowling, and also the popular Japanese manga Full Metal Alchemist. Here, characters or plot structure follow an alchemical magnum opus. In the 14th century, Chaucer began a trend of alchemical satire that can still be seen in recent fantasy works like those of Terry Pratchett. ^ "alchemy | Definition of alchemy in English by Oxford Dictionaries". Oxford Dictionaries | English. Retrieved 30 September 2018. ^ a b c d e f g h Pereira, Michela (2018). "Alchemy". In Craig, Edward (ed.). Routledge Encyclopedia of Philosophy. Routledge. doi:10.4324/9780415249126-Q001-1. ISBN 9780415250696. Alchemy is the quest for an agent of material perfection, produced through a creative activity (opus), in which humans and nature collaborate. It exists in many cultures (China, India, Islam; in the Western world since Hellenistic times) under different specifications: aiming at the production of gold and/or other perfect substances from baser ones, or of the elixir that prolongs life, or even of life itself. Because of its purpose, the alchemists' quest is always strictly linked to the religious doctrine of redemption current in each civilization where alchemy is practised. ^ Principe, Lawrence M. The secrets of alchemy. University of Chicago Press, 2012, pp. 9-14. ^ Malouin, Paul-Jacques (1751), "Alchimie [Alchemy]", Encyclopédie ou Dictionnaire Raisonné des Sciences, des Arts, et des Métiers, Vol. I, Paris: translated by Lauren Yoder in 2003 for Michigan Publishing's The Encyclopedia of Diderot & d'Alembert Collaborative Translation Project, hdl:2027/spo.did2222.0000.057 . ^ a b Linden (1996), pp. 7 & 11. ^ Newman, William R.; Mauskopf, Seymour H.; Eddy, Matthew Daniel (2014), "Chemical Knowledge in the Early Modern World", Osiris, 29: 1–15, doi:10.1086/678110, PMID 26103744 . ^ a b von Franz (1997). ^ a b c "alchemy". Oxford English Dictionary (3rd ed.). Oxford University Press. September 2005. (Subscription or UK public library membership required.) Or see Harper, Douglas. "alchemy". Online Etymology Dictionary. Retrieved 7 April 2010. .
^ See, for example, both the etymology given in the Oxford English Dictionary and also that for χυμεία in Liddell, Henry George; Robert Scott; Henry Stuart Jones (1940). A Greek-English Lexicon (A new edition, revised and augmented throughout ed.). Oxford: Clarendon Press. ISBN 978-0-19-910205-1. ^ Clement, Stromata, vi. 4. ^ Burckhardt, Titus (1967). Alchemy: Science of the Cosmos, Science of the Soul. Trans. William Stoddart. Baltimore: Penguin. p. 66. ISBN 978-0-906540-96-1. ^ Burckhardt, Titus (1967). Alchemy: Science of the Cosmos, Science of the Soul. Trans. William Stoddart. Baltimore: Penguin. p. 46. ISBN 978-0-906540-96-1. ^ a b Burckhardt, Titus (1967). Alchemy: Science of the Cosmos, Science of the Soul. Trans. William Stoddart. Baltimore: Penguin. p. 29. ISBN 978-0-906540-96-1. ^ Felix Klein-Frank (2001), "Al-Kindi", in Oliver Leaman & Hossein Nasr, History of Islamic Philosophy, p. 174. London: Routledge. ^ Marmura ME (1965). "An Introduction to Islamic Cosmological Doctrines: Conceptions of Nature and Methods Used for Its Study by the Ikhwan Al-Safa'an, Al-Biruni, and Ibn Sina by Seyyed Hossein Nasr". Speculum. 40 (4): 744–6. doi:10.2307/2851429. JSTOR 2851429. ^ Robert Briffault (1938). The Making of Humanity, p. 196–197. ^ Holmyard 1957, pp. 134–141. ^ Burckhardt, Titus (1967). Alchemy: Science of the Cosmos, Science of the Soul. Trans. William Stoddart. Baltimore: Penguin. p. 149. ISBN 978-0-906540-96-1. ^ Burckhardt, Titus (1967). Alchemy: Science of the Cosmos, Science of the Soul. Trans. William Stoddart. Baltimore: Penguin. pp. 170–181. ISBN 978-0-906540-96-1. ^ Debus, Allen G.; Multhauf, Robert P. (1966). Alchemy and Chemistry in the Seventeenth Century. Los Angeles: William Andrews Clark Memorial Library, University of California. pp. 6–12. ^ "Monas hieroglyphica is not a traditional alchemical work, but has important theoretical insights about a cosmic vision, in which alchemy played an important part." Szőnyi, György E. (2015). "'Layers of Meaning in Alchemy in John Dee's Monas hieroglyphica and its Relevance in a Central European Context'" (PDF). Centre for Renaissance Texts, 2015, 118. ^ "Old Jewish Book Outlines how to Turn Copper into Gold". Retrieved 21 April 2016. ^ Richard Conniff. "Alchemy May Not Have Been the Pseudoscience We All Thought It Was." Smithsonian Magazine. February 2014. ^ Calian, George (2010). Alkimia Operativa and Alkimia Speculativa. Some Modern Controversies on the Historiography of Alchemy. Annual of Medieval Studies at CEU. ^ C.G. Jung Preface to Richard Wilhelm's translation of the I Ching. ^ C.-G. Jung Preface to the translation of The Secret of The Golden Flower. Calian, George (2010). Alkimia Operativa and Alkimia Speculativa. Some Modern Controversies on the Historiography of Alchemy. Annual of Medieval Studies at CEU. Eliade, Mircea (1994). The Forge and the Crucible. State University of New York Press. Forshaw, Peter J. "Chemistry, That Starry Science – Early Modern Conjunctions of Astrology and Alchemy". Sky and Symbol. Sky and Symbol, Edited by Nicholas Campion and Liz Greene, Sophia Centre Press. Holmyard, Eric John (1931). Makers of Chemistry. Oxford: Clarendon Press. Holmyard, Eric John (1957). Alchemy. Courier Dover Publications. ISBN 9780486262987. Linden, Stanton J. (1996). Darke Hierogliphicks: Alchemy in English literature from Chaucer to the Restoration. University Press of Kentucky. ISBN 9780813150178. Linden, Stanton J. (2003). The Alchemy Reader: from Hermes Trismegistus to Isaac Newton. Cambridge University Press. Newman, William R.; Principe, Lawrence M. (2002). Alchemy Tried in the Fire. University of Chicago Press. ISBN 9780226577029.
von Franz, Marie Louise (1997). Alchemical Active Imagination. Boston: Shambhala Publications. ISBN 978-0-87773-589-2. Kripal, Jeffrey John; Shuck, Glenn W. (July 2005). On the Edge of the Future. Indiana University Press. ISBN 978-0-253-34556-1. Retrieved 17 December 2011. Principe, Lawrence M.; Newman, William R. (2001). "Some Problems with the Historiography of Alchemy". In Newman, William R.; Grafton, Anthony (eds.). Secrets of Nature, Astrology and Alchemy in Modern Europe. MIT Press. pp. 385–432. ISBN 978-0-262-14075-1. Retrieved 17 December 2011. Rutkin, H. Darrel (2001). "Celestial Offerings: Astrological Motifs in the Dedicatory Letters of Kepler's Astronomia Nova and Galileo's Sidereus Nuncius". In Newman, William R.; Grafton, Anthony (eds.). Secrets of Nature, Astrology and Alchemy in Modern Europe. MIT Press. pp. 133–172. ISBN 978-0-262-14075-1. Retrieved 17 December 2011. Alchemy featured topic page on Science History Institute Digital Collections featuring selected manuscripts, rare books, paintings, and ephemera relating to alchemical topics and experimentation. The Alchemy Website. – Adam McLean's online collections and academic discussion.